I captured another good image of our Byssus Skipper nectaring on Blazing Star, 850 miles south of my Pittsburgh home. If this Byssus appears to be happy, content and focused, you should have been there on ‘Old Grade Trail’ to witness another happy, content and focused being: Me. That article in NABA’s Magazine, under the Destination title, was a rip for me. As soon as I opened it, earlier this 2015, my mind was riveted = Go Jeff go! I went, during my extended trip to the Butterflies & Blooms in the Briar Patch in Eatonton, Georgia. I tell you, I was one happy guy down there, AKA the kid in the candy shop. I grew blazing star in my home garden in Pittsburgh in 2013-2014. In 2014 a female Monarch spent more than one September week installed there, feasting on that Blazing star (10 plants, 8 of which exceeded 6′ in height). After she migrated away, the deer and/or woodchucks decimated the Blazing star plants, and that ended that. Didn’t replant them, and no deer or woodchucks were harmed. If and when I return to Big Bend Wildlife Management Area, in the Florida Panhandle (seen in this image) next September, must I navigate those trails alone again? That was what stuck in my head, as I drove down US 75 to the Florida Panhandle. 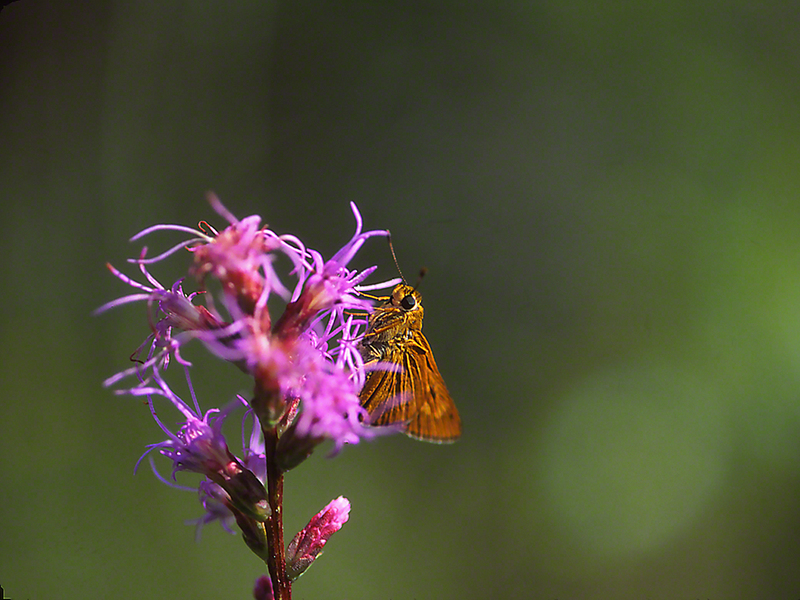 The busiest times for seeing butterflies at Big Bend Wildlife Management Area, just south of Perry Florida, are when Liatris, or Blazing Star is in bloom. At the Spring Unit area in Big Bend, they bloom in early September. Arrgh! I could not be there then and could only go there in late August. I’ve learned enough through the years to know that wildflowers often open a bit earlier or a bit later than prescribed. That’s what convinced me that I should head down there, even though it was a bit early for Gay Feather blossoming. I went, and . . . Liatris had just started to open. Yay! And, my guides were right. Just stand a bit away from these eye-popping flowers, and watch the comings and goings of a whole menu of butterflies. Now it was not that easy. The humidity was very real, and each day my sweatband would eventually get overrun by perspiration, sending moisture coursing down over my glasses. This didn’t stop my pleasure as I watched a waiting line (or so it seemed) of butterflies fly into and then away from these Blazing Stars. 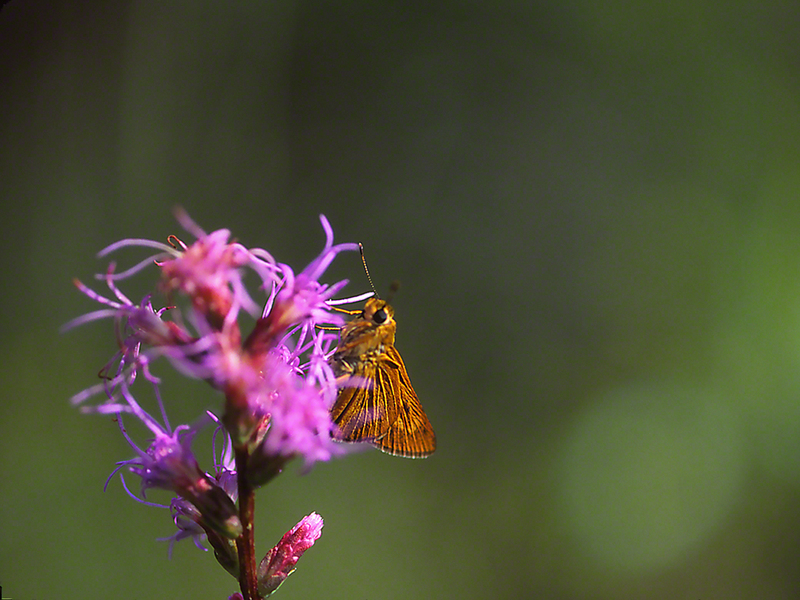 This Byssus skipper butterfly didn’t care whether you knew the flowers as Liatris, or Gay Feather or Blazing Star. Either way, that nectary sweet secretion must rival the Cherry Cokes back at Sol’s Candy Store in Brooklyn, back when! Skippers are butterflies, and there are folks who authoritatively tell one skipper species from the other. 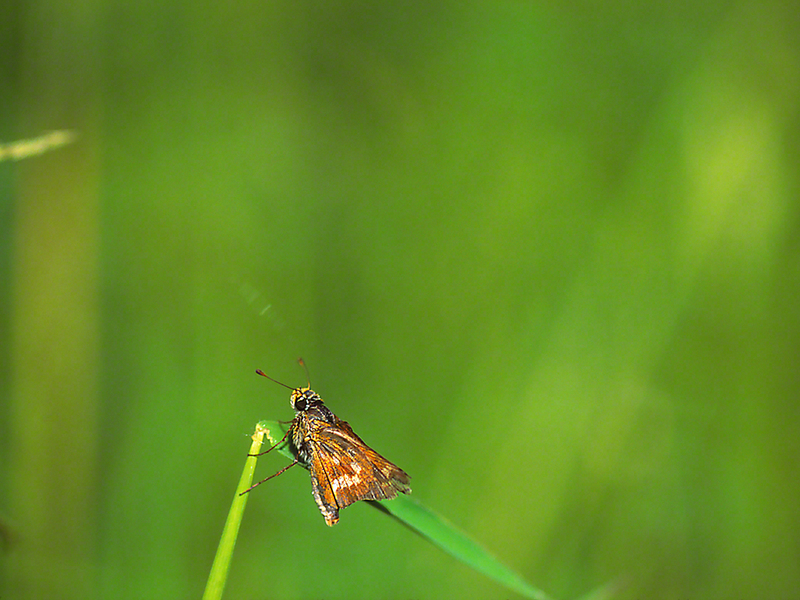 This skipper landed on this grass, just yards from Traci’s Kelso Swamp. They’re pert, meaningful and they’re brown. I value pert, meaningful and brown. Comes the question then. Which of the many small, pert, meaningful, brown skippers is this? That’s why I laughed when I made the decision to post this image. Here I go again, sort of struggling to ID this perfectly wonderful skipper. At this time, I think that he or she is a Long Dash skipper (Polites mystic). I base this upon markings, wet habitat and that this slightly worn butterfly could have appeared in August, and continue flying to the day I photographed it; in very early September. Can you imagine if I had majored in the study of butterflies in a fine university, and met all of those budding butterfly experts early on, and then . . .
A Monarch Tale of Woe: this Superstar is damaged. Shoot or Don’t Shoot? It was getting to be a problem. Here we were in Georgia, at the Butterflies & Blooms at the Briar Patch, on my 3rd trip down to this butterfly destination. Good images of Monarch butterflies just weren’t happening. First the USPS delivery of processed slides were stolen by ditzy teenagers from the front of my Pittsburgh home, only to later be found strewn on various lawns along the boulevard that we live on (after days of rain). So my May 2015 images were lost. Then, later, it wasn’t that the Briar Patch doesn’t have Monarchs. They have lots of Monarchs. Problem was that the Monarchs refused to permit good approach. My approach was met with Off it goes! I got the feeling that folks were looking forward to have a look at the photographic product of all of that time (Glorious time!) spent in the Briar Patch. 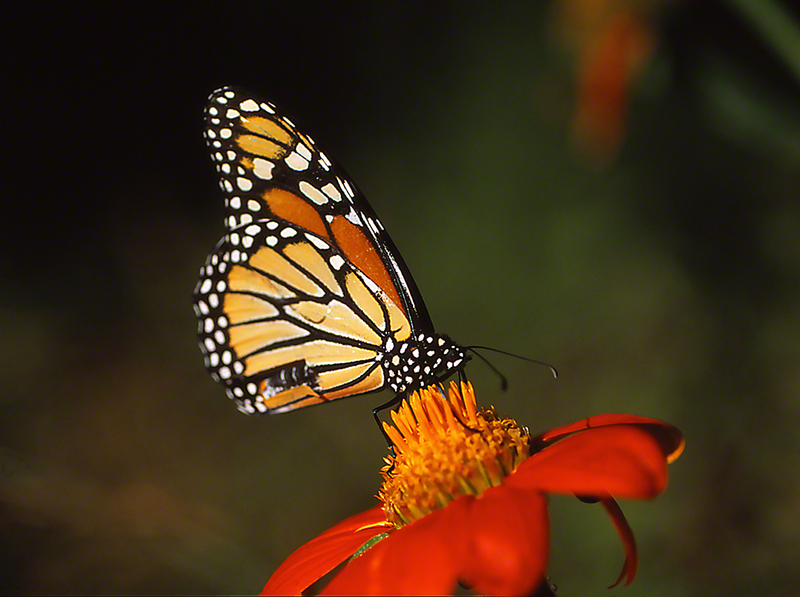 Set a moniker for 2015 for butterfly enthusiasts east of the Mississippi, and it would be: Year of the Monarchs. Then one day in August, this stunner came along. My approach? Tolerated. The light available? Just fine. My position vis a vis the butterfly? Good. Set time on the Mexican sunflower head? Good and not rushed. Something was just not right though. What was it? Oh oh! This butterfly had sustained major bird-struck damage to the right hindwing!! It was a Superstar with a glaring rip in her gown or in his tux. Shoot or don’t shoot? Virginia, Stanley, Sylbie, Dave and Phil . . . Squads of butterflies would fly in, sip nectar from flowers, search or reconnoiter. We’re in Traci’s Kelso Swamp on an early September morning, Southwestern Pennsylvania. Minutes later they’d be . . . gone. Gone where? Who knows? Search as you might, there’d be no butterflies to be seen for some 10 to 15 minutes. That’s when you start noticing the other residents at the swamp’s edge. 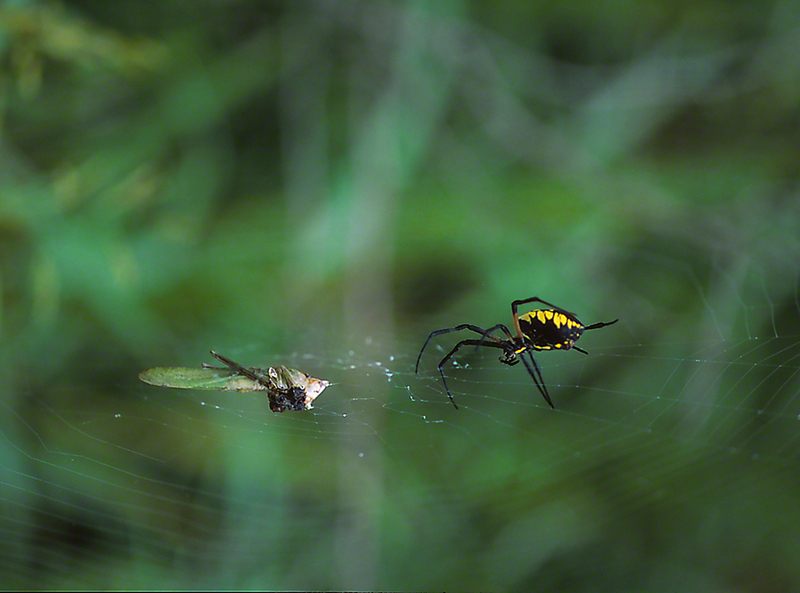 Most memorable were those Black and Yellow Argiopes, the huge garden spiders that build their webs 2-4 feet across from one plant to another. We had laughed days before, when I reported to blog readers that the web ‘silk’ of Georgia’s southern argiopes tasted exactly like the silk of these Allegheny county spiders. It is difficult to capture a good photograph of one of these argiopes. This one had ensnared prey on its web. She was headed over to it once again, to feed, tend or check the permanence of this capture. Ok, I had a lull in my wingedbeauty butterfly photography action, and Ms. Argiope was a looker. I could get into a good position for myself. Let’s see what we can do here. Argiopes are native, handsome, and remind us of the need for preparation, dedication and patience. Much as it pains viewers to see these spiders at their work, it is vital for insect population dynamics. I saw Star Wars 7, the one that just came out. As I recover from that experience, Argiopes kind of make sense.